(This is the opening height after the garden arch has been pushed 12"/31cm into the ground). GF725 84"/213cm opening (depth of arch: 24"/61cm). Details of 8ft,9ft and 10ft arches shown below. GF721 36"/91cm Opening Hand Painted Verdigris £182. GF722 48"/122cm Opening Black, Green or Natural Rusted £184.25. GF723 60"/152cm Opening Black, Green or Natural Rusted £209.50. GF723 60"/152cm Op Etched Galvanised, Unpainted Galvanised, Cream or White £255.80. GF723 60"/152cm Opening Hand Painted Verdigris £281.40. GF724 72"/183cm Opening Black, Green or Natural Rusted £317.50. GF724 72"/183cm Op Etched Galvanised, Unpainted Galvanised, Cream or White £370.45. GF724 72"/183cm Opening Hand Painted Verdigris £407.70. GF725 84"/213cm Opening Black, Green or Natural Rusted £381.25. GF725 84"/213cm Opening Hand Painted Verdigris £532.65. GF726 96"/243cm Opening Black, Green or Natural Rusted £468.60. GF726 96"/243cm Etched Galvanised, Unpainted Galvanised, Cream or White £557.60. GF726 96"/243cm Opening Hand Painted Verdigris £621.50. GF727 108"/274cm Opening Black, Green or Natural Rusted £557.25. GF727 108"/274cm Etched Galvanised, Unpainted Galvanised, Cream or White £636.05. The 7ft, 8ft, 9ft & 10ft Opening English Rose Arches are made to special order. This takes about 2 weeks depending on the time of year. All our garden arches are made from solid rod and not from tubes which can only rust and rot away. There are also no plastic joining components. 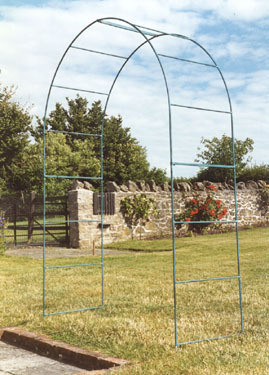 Two 4 ft opening English Rose Arches can be joined together with an attractive Top to form the English Rose Gazebo which has a diameter of 8 ft or 244cm. This Gazebo is an ideal centre point for any garden and also supports and displays climbing plants and flowers. Both the 4 foot opening and the 5 foot opening English Rose Arches can be joined together to create a Tunnel or Walkway. These are becoming ever more popular features in many gardens. For details of these and other Tunnels or Walkways click here.There is a delivery charge based on the order value-see details at the bottom of this page.